All grass seed must have an analysis tag; be it tall fescue, perennial ryegrass, Kentucky bluegrass, Bermudagrass seed, Zoysia and more. However, only certified seed has an additional tag. The above indicates that the seed is Oregon Certified. It is commonly referred to as "blue tag" seed. For Newsom Seed to make a Maryland Certified Sod Mix or SHA Mix, the seed must first be Oregon Certified. This guarantees the consumer of the variety of the seed in the bag and that it meets certain minimum requirements. However, the Maryland Department of Agriculture requires more than just the seed being Oregon Certified. Before we can do a certified mix, the seed must be sampled by a representative from the Maryland Department of Agriculture. The sample is then taken to the lab at the Department of Agriculture and tested for germination and purity. If it meets their requirements, the seed is then approved to be mixed. Another very important source for choosing varieties best suited for your area is the National Turfgrass Evaluation Program. Directly below are links to the most current test data. The varieties listed below are not always available. Please contact one of our Team Members for current information. Kentucky 31 is an older proven variety that can be used where an economical, wear resistant, easy to establish tall fescue is desired. MVS has developed a new class of tall fescues that through natural mechanisms like tillering and rhizome formation more aggressively establish, spread, and fill in, creating a turf of higher density particularly under stresses. These releases are coded with the LS suffix. A release from the Lateral Spread Technologyâ„¢ program, Firecracker LS has scored in the highest NTEP grouping for overall quality under medium fertility, traffic, and hot humid environments. It is among the finest in texture, with very uniform growth. A release from the Lateral Spread Technologyâ„¢ program, Spyder LS has scored in the highest NTEP grouping for overall quality under medium fertility, traffic, and shade. Tops in density under drought, its aggressive behavior crowds out weeds. A release from the Lateral Spread Technologyâ„¢ program, Titanium 2LS exemplifies the perfect high-quality turfgrass; it's dark green, very dense, and has excellent wear tolerance. In addition Titanium 2LS is very drought tolerant, keeping its great looking appearance late into the summer even under less-than-ideal conditions. Apple SGL Perennial ryegrass is bred for resistance to gray leaf spot. Also exhibits broad spectrum disease and insect resistance. Improved tolerance to saline irrigation. Vigorous & aggressive. Cold tolerant. Breakout is a great annual ryegrass with smooth transition technology to germinate quickly and not persist into summer. It has excellent turf quality and a dark green color to blend well with other grasses. 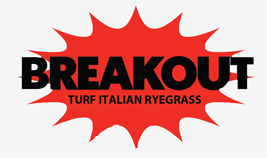 Breakout is a high density turf with fine leaf texture giving it great aesthetics and playability. Grand Slam GLD is bred with resistance to gray leaf spot and improved drought tolerance. It offers fast establisment and high traffic tolerance. New resistance to gray leaf spot disease. Tops in establishment and spring green-up. Excellent low cut fairway and traffic stress performance. Retains density and color throughout the season. Compact, Compact America, Mid-Atlantic, Julia, BVMG, Shamrock and more. To see some of the varieties that fall into these categories, click below. Blue Coat is an improved variety that offers a darker green color and fine to medium leaf texture. It has exhibited high resistance to diseases. Blue Coat can handle heavy traffic and has excellent density during the growing season. BlueNote is a compact America type bluegrass featuring excellent color, texture, density, and shade tolerance under normal to moderate fertility management, including lowered mowing heights. BlueNote has very good cold tolerance and better winter color than most varieties. Bolt jumps out of the ground faster than any other Kentucky bluegrass in the recent NTEP trials. Bolt has excellent disease resistance and is well adapted to both high and low maintenance uses. Its quick establishing ability makes it a great choice for sod farms, sports fields and home lawns. Fahrenheit 90 is a Texas hybrid that resembles Kentucky bluegrass in color, texture, density, and rhizomateous regrowth extension; but with improvements in the heat and drought tolerance that should extend bluegrass usage through the Transition zone and South. It is medium green in color, with a fine texture, and moderate growth habit. It readily establishes in most soils and aggressively fills-in to form a dense uniform turf. Fahrenheit 90 has shown good persistence in moderate shade. Midnight is the strongest performing, most popular elite Kentucky bluegrass ever developed. With a dark green, compact growth habit, Midnight's unique beauty & performance have stood out in National Turfgrass Evaluation Program (NTEP), private, and university trials for more than 20 years. Midnight has set the bluegrass bar since 1984 and is still the recognized standard of quality. Skye Kentucky bluegrass is an excellent choice for sod farms, homeowners and turf professionals alike. Its reduced vertical growth habit translates into less frequent mowing, less clippings, and lower maintenance costs. Wild Horse trounces the old workhorses! It is an excellent variety to use in bluegrass blends and for mixing with tall fescue. Characteristics include rapid germination, medium leaf texture, excellent disease resistance, aggressive & vigorous, low-mow and high tiller density. Riviera is an excellent choice for golf courses, sports fields, residential and commercial lawns. Riviera is first overall for winter kill resistance, spring green-up and percent spring living ground cover, good color and drought tolerance. 007 is an advanced generation creeping bentgrass variety developed by the New Jersey Agricultural Experiment Station (Rutgers University) working in cooperation with Richard Hurley, Ph.D. 007 creeping bentgrass has a broad genetic base developed using twenty four parent plants, including plants identified from the varieties L-93 and Southshore. Additional clones were collected from older greens on high stress golf courses in the northeast USA. This new, improved variety is well adapted to any U.S. and overseas areas where creeping bentgrass is being utilized for golf course greens, tees and fairways. BARRACUDA creeping bentgrass (MVS AP-101) is an advanced generation broad genetic based variety developed in cooperation with Rutgers University. Nine unique parents, the result of extensive screening programs for improved disease resistance, high shoot density, and lower input sustainability, all trace back to plants collected from old golf courses in the United States. Crystal Bluelinks had the highest turf quality across all locations during the 2006 NTEP fairway/tee trials. It has a brilliant blue/green color. Has show good resistance to Brown Patch and Dollar Spot and has also shown good heat tolerance. L-93 is now gracing the greens, tees and fairways of top golf courses nationally as well as internationally. Its reputation for being dark, dense and aggressive has made it a world-renowned name in creeping bentgrass. It has fine textured leaves, dense, upright growth creating a perfect lie for a golf ball. It has excellent winter hardiness and adapts well to a wide range of mowing heights. A-1 performs well under a wide range of climatic conditions. It spreads by stolons and tillers, exhibiting very dense, upright growth. A-1 has a very fine leaf texture due to the dense tillering, and it exhibits moderately aggressive growth and excellent recuperative capacity. Mixing A-1 with A-4 comes highly recommended for over-seeding & putting greens. A-4 is dark green with fine leaf texture, exceptional heat & cold tolerance, high density, disease resistance, and aggressive growth habit. It provides a smooth, grainless putting surface. Mixing A-4 with A-1 comes highly recommended for over-seeding & putting greens. The standard for creeping bentgrasses since 1955 and still the most specified bentgrass for golf courses. Recovers quickly from injury and divots. Good heat and wear tolerance. Shark Creeping Bentgrass is aggressive, has a bright dark green color, with high shoot density. More upright. Improved summer performance and disease resistance, particularly to dollar spot and take-all patch.